IAM Local 2525 Shop Steward Scott Filler talks to local Fargo, ND news station after young thief attempts to steal Filler’s IAM “Proud Union Home” yard sign from his front yard. What’s union pride? When an IAM member runs down a thief for stealing his IAM “Proud Union Home” yard sign… (and his story makes the local news). That’s what happened to IAM Local 2525 Shop Steward Scott Filler one night while relaxing at his home in Fargo, ND. Filler, an agriculture assembly line worker at Case New Holland in Fargo, says he received the IAM Midwest Territory “Proud Union Home” yard sign from his Local just a few weeks prior. The nearly 13-year IAM member and son of a United Transportation Union member proudly displayed the sign in his front yard for all to see. One night, while watching the evening news, Filler says he saw a news story about local residents complaining about college students from North Dakota State University (NDSU) partying at all hours of the night, playing loud music, vandalizing and leaving trash on neighbors’ lawns. Filler lives about four blocks from NDSU. The news asked if any other residents had problems to contact the newsroom. At the moment Filler says he quickly recalled frequently seeing groups as large as 30 students walking by his house at times, but says he didn’t think much of it. Shortly after midnight that same night, he heard a “ruckus” outside his front door. When he went to the window to investigate, he saw a group of kids walking by – and noticed something was missing. Filler quickly checked his house surveillance video and saw that one of the kids had just swiped the sign minutes earlier. Needless to say the student complied, though Filler says he complained that it wasn’t Filler’s sign the whole walk back. The entire ordeal was caught on Filler’s home surveillance system. Filler called the news station and reported what happened. 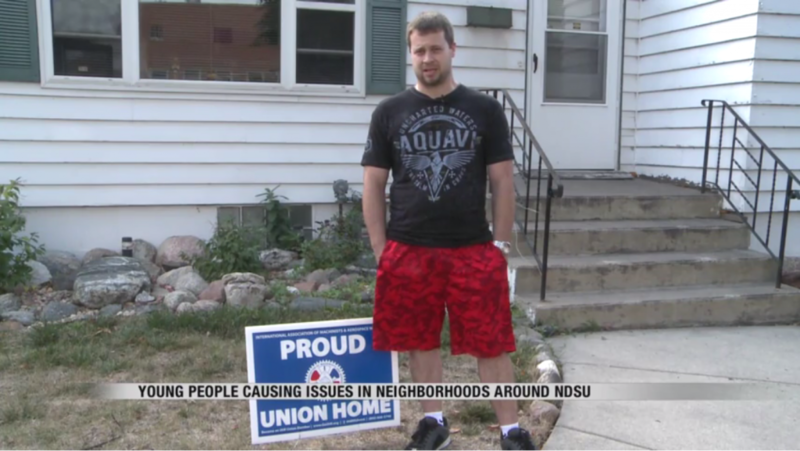 What followed was a full-on news story with Filler and his IAM “Proud Union Home” yard sign standing center stage. Watch full coverage of his story here! Filler says he didn’t have to chase the student down. He could’ve just let the sign go. But, in affirming what the sign stood for and recalling his days as a child when he himself stood on a Canadian Pacific Railroad strike line with his union father for 1.5 months, Filler says his union pride wouldn’t let him.